Frank was born in 1891, the only son of Frank Church and his wife Alice née Farmer. He only had one sibling Winifred Gwendoline, who was born 9th Jan, 1900. His father, Frank senior, originally from Donnington, was a labourer who died in 1906, while Frank junior was still a teenager. Young Frank finished school and found employment on the railways as a porter. His work took him to London, where he was living in 1911 as a boarder in the home of Richard Elliot, an engine driver on the railways. In 1911 Frank married Beatrice Wedge in Paddington, which was Beatrice’s home since her birth in 1887. War diary, 13 October 1915, 8th Battalion, Royal Berkshire Regiment. 1.0pm. Precisely at 1.0pm the chlorine gas discharge began, and was continued at intervals until 1.50pm. During this time smoke bombs were thrown out by our men from the front line trench. The wind seemed very favourable and carried the gas and smoke towards the enemy trench. 1.50PM. The gas discharge ceased, the artillery lifted, and the Battalion wire-cutters accompanied by men carrying smoke bombs went forward under cover of the smoke.. During the whole time of the smoke discharge hostile machine gun fire from our right flank could be heard. 2.0PM. The remainder of the two companies in the front line went over. From reports I have since received it appears that about only six of these men reached the Estimate across the road owing to heavy machine gun fire from the right flank which seemed to come from the directions of the CHALK PITS. These men remained at the Estimate until dark and then crawled back. 2.10Pm a report reached me that our first line had attained the road but were being enfiladed. I then ordered two platoons of the supporting companies to go over. As these crossed our first line, the Machine Gun Officer, with his team joined them. This Officer reports that by this time the smoke was beginning to thin, and that his team had got out about 75 yards beyond our parapet when they came under machine gun fire and were cut down. From inquires I have made from NCOs it appears that about fifteen men of this line reached the road but didn’t cross it. They report that there was little rifle fire from the German trench. Hand grenades were thrown at them from the enemy’s trench, but these fell short by about ten yards. 2.20PM. The remainder of the Battalion went over, but they were no more successful than the others in reaching their objective. During the night these men who had escaped crawled back to our front line trench. I attribute the failure of the attack to the inability of our artillery to silence the German machine guns, and to the complete absence of support. 2nd Lieuts L.A. KLEMANTASK; G.B.COOTE; R.S.P. Poynte; W.I. CLARKE; F.M. SUMPSTER and F. GARDENER joined them from the 9th Royal Berkshire Regiment. CHURCH – Killed in action, somewhere in France between the 13th and 15th inst, Pte Frank Church, of the 8th Batt Royal Berks, the dearly loved and only son of Mrs A Church and the late Frank Church, of 3 Orts-road, King’s-road, Newbury, aged 24 – Deeply mourned. 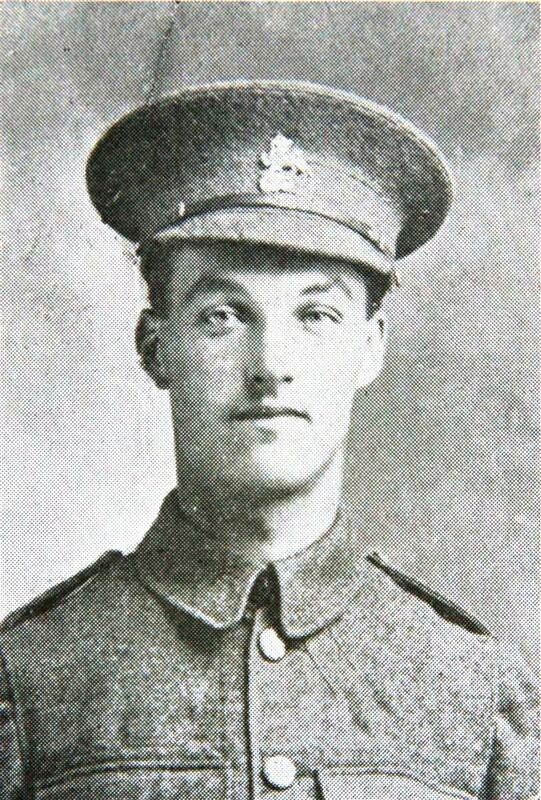 Private Frank Church of the 8th Royal Berks, succeeded in surviving the terrible charges in which the battalion took part, and then met his death from the bullet of a German sniper. He was killed on October 13th. He was a Newbury lad, son of Mrs A Church, and the late Mr Frank Church, of Orts-road, King’s-road. He had gone to live and work in London, but when the call came for men, he returned to his county and joined the Berkshires. He enlisted in June and trained with the 9th, but was drafted out to the 8th battalion in September. He was 24 years of age, and leaves a young wife. It was the same old cry 'Come on the Berks' and over the top we went. When we got over, there was something waiting for us in the shape of German machine guns. They were continually sweeping the ground with them from one end of our line to the other. They fire from five to six hundred bullets a minute, so you can see it was pretty warm. When I got across to within 20 yards of the German trench, and as it was a bit too warm, I dropped down into a hole where a 'coal box' had fallen. There I had to lay, not daring to move so much as an eye lash, or it would have been my last move as there was a machine gun at work in front of me and snipers all round. To make it worse they had spotted me, for they had taken several pots in my direction, but I kept a bit too low for them. I had to lay there for four hours till it got dark so that I could crawl back to our trench. When I did move I thought my back was going to break as I had been so cramped up. As soon as it began to get dusk I started crawling. I went backwards for the first 100 yards, watching the German trench all the time and then I turned round and had a go head first, expecting every minute to be made a pepper box of by bullets because they kept sending up 'starlights' and these made night as light as day. It took me two hours to cover 150 yards. But I thank God that I got back safely. To make it worse I had to lay beside dead comrades, one dying quite near me. Frank’s body was never identified; perhaps he lies in one of the thousands of graves marked 'Known unto God'. His name is commemorated on the Loos Memorial to the missing at Dud Corner Cemetery, near Loos-en-Gohelle. In loving memory of Pte Frank Church, killed in France October 14th, 1915, sadly missed by his sorrowing Wife, Mother, and Sister. 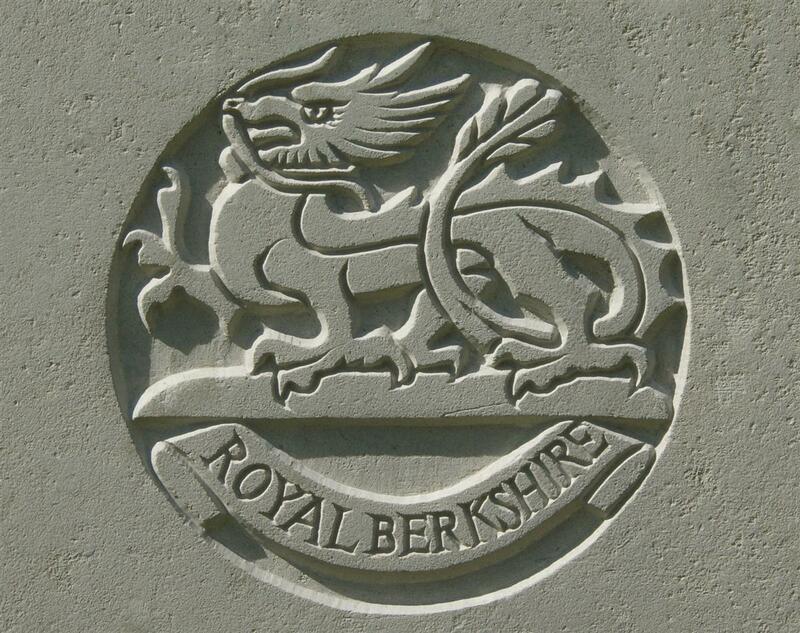 To the dear memory of Pte Frank Church, 8th Royal Berks, killed October 14, 1915. From his Wife, Mother, and Sister. 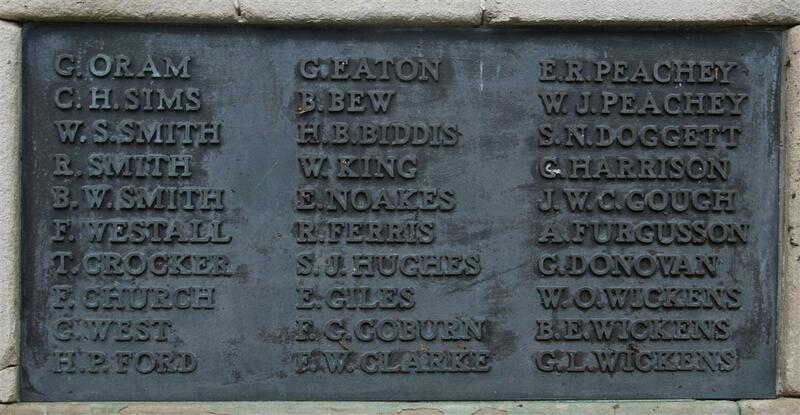 To the ever dear memory of Pte F Church, of the 8th Royal Berks, killed in France October 14th, 1915. And whispers dear loved ones death cannot divide. Frank’s wife, Beatrice, remarried, on 6 September 1920 at St Judes Church, Kensal Green to Herbert Brooker a fish monger living at 94 Mount St, Mayfair. It seems that the marriage was childless; Herbert died in 1963 and Beatrice in 1977. His mother, Alice, died in 1940 aged 70; in 1921 his sister Winifred married Arthur James Whiting from Donnington, they had three daughters: Alice, Barbara and Eileen. Winifred died in 1989 aged 89.